College students are busy trying to manage their studies, go to work and maintain a social life. They don’t have time to sit down and read a newspaper to catch up on global issues. It is with the help of technology that allows the students of Southern Connecticut State University to keep up with what’s trending. Any iPhone or Android phone is equipped with an app store that provides free phone applications. Among the categories are news apps. “I’ll look on my CNN app when I have time,” Maya Kelly, West Campus residential advisor, said when asked how she get her news. Cell phones provide students with convenience seeing as how they are found in their bags or pockets. Even walking through campus, it is likely to see students walking to class while looking at their phones. 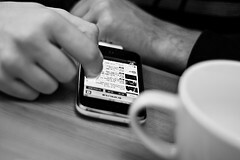 Popular social media apps, such as Twitter and Facebook, update news stories hourly. Twitter can be accessed with any smartphone. Professors have started becoming more lenient when it comes to cell phone because of this. According to Business Insider, twitter has a following of 232 million active accounts. That would suggest that 232million people have access to the news stories. Followers do not even need to a follow NBC or FOX news to get access to their stories. Important details are either advertised, and therefore at the top of every newsfeed, or found in the trending section. Similarly, Facebook has updated its software within the last year to add trending news stories on the right side of the screen. After being open to the public in 2006, Facebook now has 1.23 billion users with 945 million mobile users. Those that don’t possess smartphones may still get access to the news on campus. Southern is full of classrooms that have interest access. Many buildings, such as the student center and Engelman have computer labs for student use. There are some students that take a more traditional approach. “I watch the world wide news,” student Maria Weselyj said. It isn’t as convenient as carrying around a cellphone with news on its apps, but many students find watching the news on television to be the best source. In the wake of breaking news, Connecticut dining hall offers a television for students to catch up on news while eating breakfast, lunch and dinner. The Adanti student center and every residence hall lobby are each equipped with televisions too. Students on campus don’t need to go out of their way. Buildings on campus also offered free newspapers. By the information desk are free stacks of Southern News, the campus newspaper. Students are encouraged to take one on their way to class. The New Haven Register is also available to students in both academic buildings and many residence halls. If smartphones, news broadcasts and newspapers aren’t enough, there’s the old fashioned way. Even with modern day advances, some students resort to hearing about events from other people while socializing. Though that has its conveniences, word of mouth is one of the less accurate forms of receiving news. Verify rumors through well-known news media sites, such as the New Haven register or the CNN app on a cell phone. When all else fails, there are always bulletin boards that are spread all over the campus. Posters with campus events can be found in any building at Southern.